Nathan P. Gilmour , 17 October 2013. If the stories of the Biblical text are the core of the testimony (as I discussed in BrueggeBlog 2), certain questions arise: does the story of Job stand as the real core, and the story of the Exodus as periphery? Should we assume that Saul lost the kingdom due to his usurping Samuel’s right to sacrifice animals before battle (1 Samuel 13), due to his refusing to execute the king of the Amalekites when he captured him (1 Samuel 15), or for some other reason entirely? Does the story of David’s troubled and troubling career in 2 Samuel serve as the “real story” and his near-perfect behavior in 1 Chronicles merely as a propagandistic revision? For that matter, where do the Psalms of David stand in all of this? And while we’re at it, what (if anything) do we make of the theories that would articulate not a simple list of Biblical authors but a network of oral traditions from which the material flows? In other words, what should a faithful Bible-reader do with theories like Wellhausen’s, which frame the Bible not as a one-shot document but as the historical product of prior historical, social, theological, and polemical historical developments? 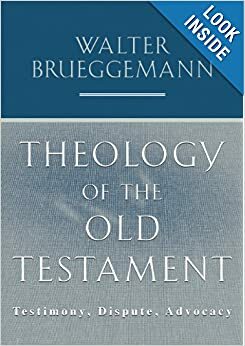 In my own experience before the Brueggemann revolution (I like that phrase now, I think), I figured the possible answers were of two sorts: either the Bible contradicted itself, a fatal flaw in any text, much less a holy book, or the Bible meant something that a reader had a piece together and harmonize. If the former acts as the filter through which one reads the Bible, then the texts become at worst a pack of lies that a moral person can’t abide and at best the sort of “primitive” book that we progresssive-minded moderns have learned to take as the best efforts of those less sophisticated and intelligent than ourselves. In that latter practice of Bible-reading, the faithful reader’s job was to put the pieces of the Biblical jigsaw puzzle together, and Procrustean readings, although they weren’t optimal, sometimes become necessary. So with regards to the fall of Saul, in the more sympathetic sort of reading, perhaps the premature sacrifice of Saul was almost enough to make YHWH forsake the first king, but Samuel’s declaration was supposed to function as a wake-up call rather than a statement of fact. Or perhaps Saul had already lost the throne after the first, but the second was a reminder. Whatever one does with the text, though, in either of those paradigms, there is a singular “right” way to interpret the text, and the job of careful reading is to establish that interpretation as clearly and without ambiguity as possible. There is no one like Yahweh, whose concrete disclosure permits a generalization in this particular way. There is no one like Yahweh, whose whole existence and life are committed in a relation to Israel. There is no one like Yahweh, a God marked by tenacious fidelity toward and solidarity with Yahweh’s subject people. There is no one like Yahweh, who while endlessly faithful, hosts in Yahweh’s own life a profound contradiction that leaves open a harshness toward the beloved partner community. That collage-image is what Brueggemann’s insistence on plurality brings to my own theology: the testimonies of Genesis and Exodus, of Ecclesiastes and of Job, and–because I am a Christian–of John and Paul and Hebrews must never cut off each other’s edges so that the picture of God is a well-ordered but repressive grid of images; instead, the bits of testimony and poetry and even protest must all exist together, knowing that such a co-existence is no rectangular bumper sticker but an ever-spreading, ever-contested mess, a cacaphony that we can only call a harmony if we stop reading carefully, in other words a collage. Because I’m a teacher, the freedom to teach Bible as collage has done wonders in church contexts and in the college classroom. Because I confess that the collage is always getting away from me, I have the liberty to teach the book at hand for all it’s worth, not worrying that I’m going to steamroll Paul by teaching Matthew or undermine Job by teaching Proverbs. The glory of the Bible is that Amos is still going to be there when I get done reading Ezekiel, and even if I find 1 Chronicles a more convincing picture of David’s reign (I don’t), 2 Samuel is still there when I’ve given 1 Chronicles a full, robust reading on its own terms. The life of the faithful (Israel and, as I confess, Church) is one of ongoing interpretation, and in any given interpretive moment I don’t have to encompass all of those multitudes. (Yes, folks, that was an American-literary reference.) Instead I can be content to work, in this moment, as the part of the collage that’s before me and around me, knowing full well that God’s revelation was a plurality from the outset, that my contribution later might be as another element of the collage. And that’s a good thing to know as one works out one’s salvation, and it’s a good way to put all of that fear and trembling into a context that makes sense of them.